The University of Seoul (UOS) was established in 1918, and now it has been 100 years since it started. Now there are about 12,000 students enrolled at UOS. However, many people in UOS do not know about all the buildings on the school campus if they are not directly related to them. 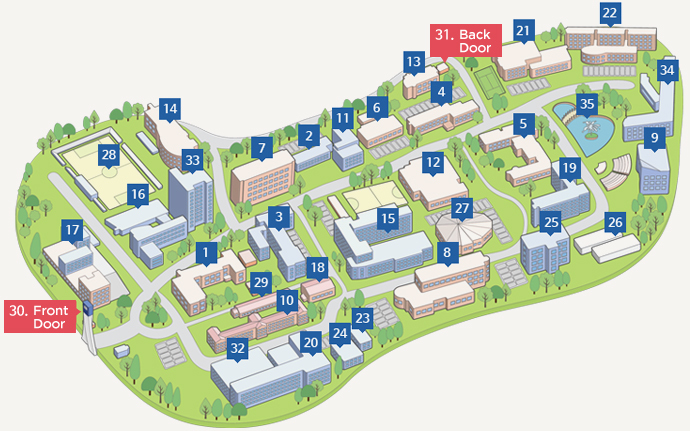 How many buildings do you know are on the campus of UOS? Do you know the history of each building in which you take lectures? The UOS Times will give you various stories and information about the campus of UOS. UOS Campus is 426,799 square meters in extent. Many people cannot realize how big it is, but an average soccer field is about 8,250 square meters. So, figuratively speaking, 50 soccer fields can be placed in the campus. According to the map posted on the official website, there are 28 buildings in UOS campus, except for the greenhouses and the two gates of the school. All of these buildings are important for students and each building has its own story, but The UOS Times will introduce four buildings that are meaningful in UOS because of their history and uniqueness. Also, 2018 is the 100th anniversary of UOS’s foundation, so there will be an introduction about the centennial memorial of UOS. Kyongnong Hall is the oldest building in UOS. It was built in 1937, during the Japanese colonial era, when UOS’s name was Kyung Sung Public Agricultural College. Kyongnong Hall’s name came from it. 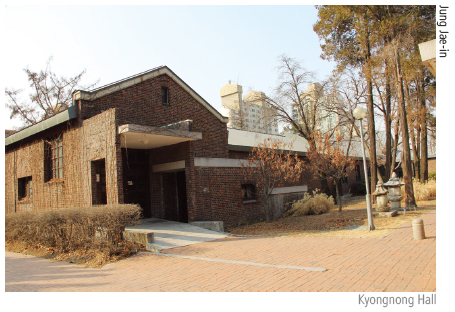 In 2013, three buildings (Kyongnong Hall, University Museum and Birch Hall) were remodeled by professor Lee Chung-hee, from the Department of Architecture. After the remodeling, these three buildings won the grand prize in the Seoul City Architecture Contest. The judges of this award appraised those buildings because they have their own historical meaning. All the buildings were built during the Japanese colonial era, and they are still preserved in a good condition. Also, when UOS remodeled these buildings, the university tried to protect their original structure as much as possible. This means sustainability and reproduction in our environment, which are important values in society these days. Nowadays, The Institute of Seoul Studies use Kyongnong Hall and the University Museum. There is an exhibition hall and office of The Institute of Seoul Studies in here. Also, the University Museum holds exhibitions twice a year. It has about 6,000 artifacts in it. There is a website of the museum, so anyone can visit it and get information about it. Lastly, many people use Birch Hall for a variety of reasons. For example, it is a small auditorium, so many events such as conferences are held in here. It is also used as a wedding hall during the weekends. What building can be called well made? Maybe, the Law School of UOS can be an answer. It was built in 2008 and it took an award from the Seoul City Architect Festival in 2009. Seoul City Architect appraised that it has “social capability”. It meant that this building could change the image UOS had before among many people. 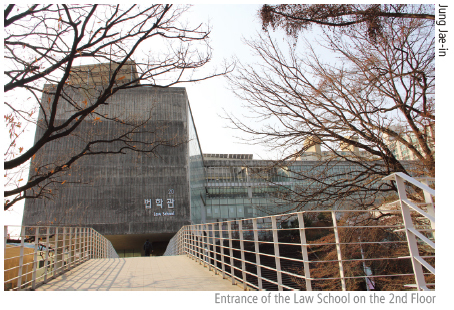 According to Seoul City Architect, before the Law School was built, UOS was thought to have authoritative and old-fashioned image. However, after the construction of the Law School, UOS is considered to have a more open and promising image. It is because the whole structure of the Law School is a mixture of landscape and building, using different materials. For example, a part of the Law School building is made up of whole glass walls with metal paneling. At the same time, there are lawns and trees planted in front of the building. This mixture of different contrasting materials makes the building more unique and harmonious. They found a harmony in its function also. In the Law School building, there are two kinds of spaces that are used differently. Classrooms of the UOS Law School and a fitness center of UOS called the Wellness Center are located in the same building. This also gives harmony to the building. 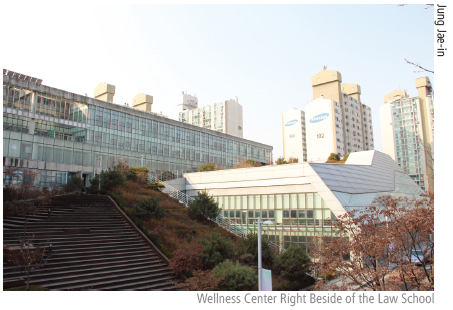 As mentioned above, the Law School building has Wellness Center where people can exercise. Also, there are classrooms, auditoriums, a lounge and libraries where students can study. Because it has many kinds of rooms, it is big building that has five floors. Unlike other buildings that have stairs only inside of the building, the Law School building also has stairs outside. The outside stairs are made of wood and are located at the front of the building. People can use the stairs to go up at each floor easily. The Music Building is located behind the Sky Pond. It is one of the farthest buildings from the Front Gate of UOS. At the same time, it is the latest building constructed in UOS. The old Music Building was located beside the Design and Structure Building, nearby the Front Gate. Since its old age, there were many defects in the building. So UOS dismantled the old Music Building and rebuilt a new Music Building. According to faculties, it has the greatest sound equipment around the country. To deliver sounds of music fully, concert hall’s walls should be made of wood, but not many concert halls are made of wood due to budget. Unlike these concert halls, the Music Building in UOS is built with wood to give a great impression with music to people who visit here. The material of the building is eco-friendly because it is made of wood or other kinds of natural material. Also, it uses a geothermal system to heat the building. Therefore, it has high energy-efficiency, which is an important issue these days, since environmental issues are considered seriously. In the Music Building, there are classrooms for students in the Department of Music. There are 28 rooms for students to practice and four classrooms to study. This solved the problem that students in the Department of Music did not have places to practice before. Also the concert hall can accommodate an audience of up to 300 people. Students in the Department of Music and professors of Department of Music perform in this concert hall. Not only people in UOS, but also Seoul citizens can participate in programs in the Music Building, listening to music with great surroundings. 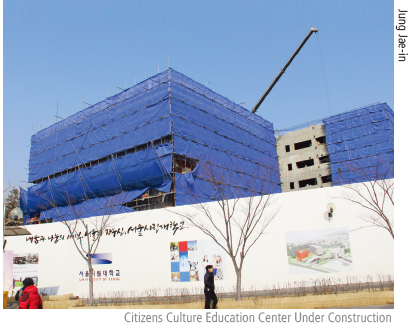 To celebrate the 100th anniversary of UOS, the Citizens Culture Education Center is under construction. The construction will be finished in April 2018. 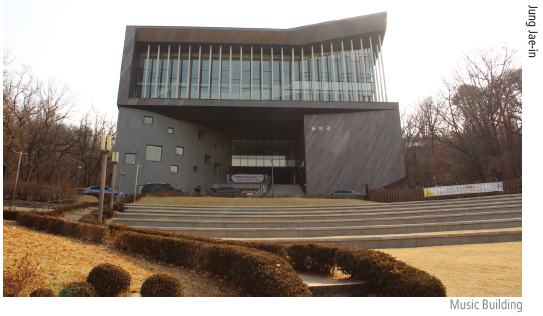 Because UOS has a close relationship with Seoul citizens, this building is built to share a variety of culture and knowledge to citizens, according to the faculty of UOS. Also, it reminds us of the history of UOS, because it uses bricks from the old Music Building on the 1st ?oor. UOS hopes this place will be the perfect place for students and citizens in Seoul to integrate, according to an interview with faculty. There will be classrooms, conference room, a fitness center, library, and many other kinds of spaces. Except for places where students study, all facilities will be opened to citizens. So, people can use these spaces as freely as they wish. This accessibility is reflected in the structure of the building. The Citizens Culture Education Center has three buildings and they have exterior space where people can rest. Also, since the whole material used to build this building is eco-friendly, it will get the highest rank in the eco-friendly test. Although The UOS Times introduced only four buildings. There are still other buildings that have unique and interesting stories. With this article, we hope people know better about our campus that many people use every day.